Rockland Trust sought to increase their small business and commercial lending business. With small businesses having more borrowing options than ever before, it was essential that the product offer and marketing tactics were competitive in order to drive business owners to apply. BKM created a program strategy, defining the competitive environment and opportunity in the market, and recommended segmenting offers and messaging for current deposit customers and prospects. 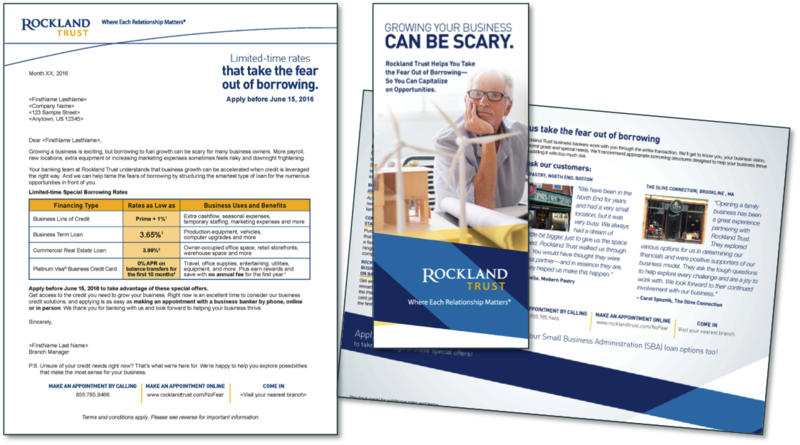 Creative for direct mail and email communications aligned with the Rockland Trust brand, including successful business customer testimonials. Additionally, BKM worked with Rockland to build an effective prospect targeting database that aligned with the bank’s desired customer risk criteria.